LMS vs LCMS vs CMS…changing one letter makes a big difference. What are the differences between LMS, LCMS, and CMS? This question often elicits confusion among those shopping for the right software tools for their organization. Not to worry—we know the difference and we are going to share our knowledge. First, let’s define our abbreviations. “LMS” is an acronym for “Learning Management System”, a software platform used to deliver and track training courses. “LCMS” stands for “Learning Content Management System”, or software used to author and manage learning content. Finally, a “CMS” is a “Content Management System”, or software used to organize content comprising a website. Commonly used in corporate training and higher education settings, learning management systems are software platforms that store and deliver training content and then track participation in training. Most LMS enable learning managers to upload online training content created by a variety of authoring tools, as long as the content is compliant with SCORM, the industry standard file format. An LMS then allows companies to assign training to their employees, track their participation, and produce documentation of employee training activity and results. In sectors where companies are legally required to provide certain types of safety or compliance training, an LMS is an essential tool to keep track of the company’s compliance. Finally, using an LMS enables companies to create different tracks of training courses to deliver to different groups of employees in order to fulfill their specific training objectives—creating a customized learning program for each employee, as needed. In addition to delivering and tracking online training courses, many LMS enable training managers to keep track of employees’ participation in other types of training programs, such as in-person classes. Bluevolt, Litmos, and Topyx are examples of a few learning management systems. What is a Learning Content Management System? In contrast to an LMS, learning content management systems are primarily used to create, store and organize elearning content. Instructional designers use this software to develop, manage and publish training content. Rather than creating course catalogs for wide audiences, LCMS platforms allow single courses to be modified for individual learners. An LCMS system usually allows multiple collaborators to work together to create content that can then be published in a variety of formats. The key difference between an LMS and an LCMS is the target user. 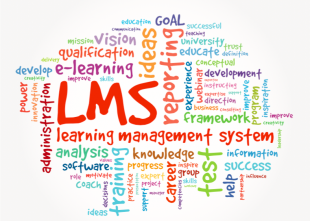 The LMS user is the learner, while the LCMS user is the learning content creator. Many LCMS also have the ability to store and deliver older versions of courses. Companies that want customized courses delivered to their employees generally use an LCMS. When designing training materials to deliver through an LCMS, learning and development personnel should research quality authors and publishers. Xyleme and Kenexa are two examples of learning content management systems. Content management systems create the framework in which content is stored and displayed on a website. These systems manage various content forms, including files, images, electronic documents, audio files, and many more. CMS functions allow distributors to decide which content is displayed privately or publicly. Content can be easily tagged using metadata, which is best for searching and using content quickly and efficiently. Drupal and WordPress are popular content management systems used to create all kinds of websites. As opposed to a CMS, a learning CMS is specialized for the creation and management of learning content. You have the ability to manage and deliver content on all three management systems. While these management systems have several similarities, they ultimately have different functions. Take some time to study these similarities and differences to avoid using the wrong acronym in professional discussions. As soon as you start using these acronyms in discussions…you’re going to sound like an elearning pro. Which management system do you use for your team? Share with us in the comments.